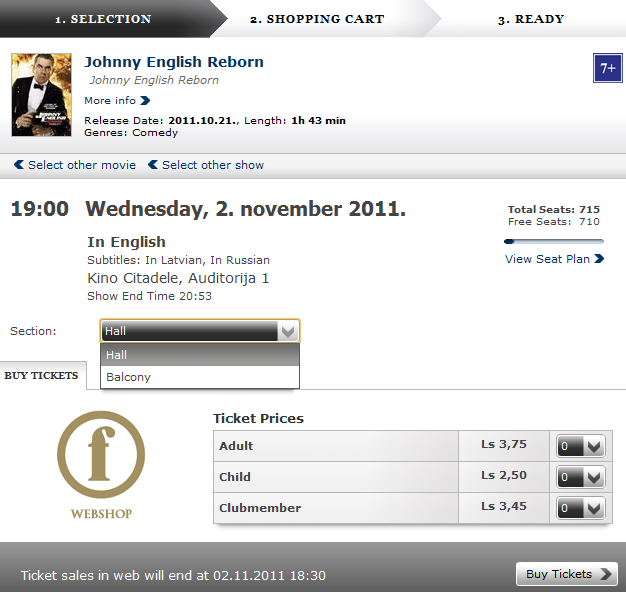 How to buy a ticket on www.forumcinemas.lv? 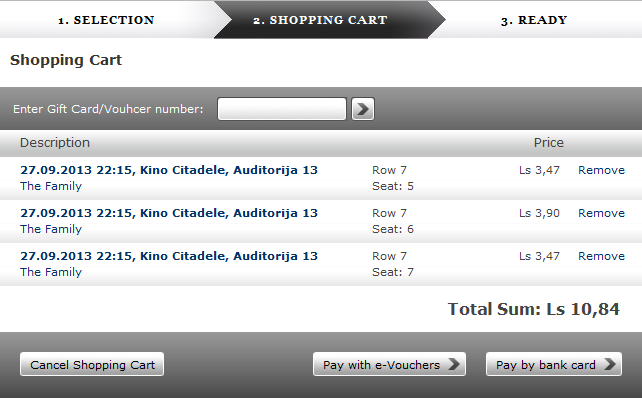 You can buy a ticket to movies, live broadcasts, film festivals and other events at cinema "Kino Citadele" online. We accept payment with Forum Cinemas gift vouchers or any payment card issued by any Latvian, Lithuanian or Estonian bank. We accept credit cards (MasterCard, Visa) and debit cards (Maestro, Visa Electron) if the issuing bank allows internet transactions. You will receive 15% discount for an adult ticket by purchase with Citadele Visa card. Discounts do not sum up and do not apply to tickets for children, family, Cinema Club shows and special events. The purchased tickets and gift vouchers may not be changed or returned on the basis of Cabinet Regulations No.255. To authorize, please, enter your user name and password on the top of the page or at My Page > Log In If you have forgotten your password, you can renew it here: My Page > Forgot password? Choose any film or event you would like to attend. You can do it in the following sections: Sākumlapa, Filmas un seansi, Biļetes > Pirkt biļeti (Home, Movies and Shows, Tickets > Buy Ticket) and other. You will have a choice of showtimes at each film or event. When choosing your screening, please, note that the 3D glasses sign marks all screenings in 3D - . 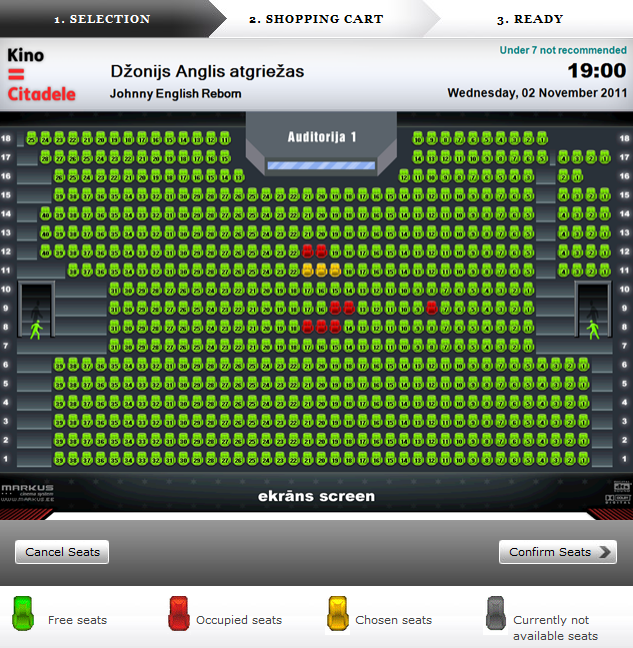 Now you have to choose the auditorium or balcony (balcony seats are available only in Auditorium 1 and 2) and the number of tickets. You are allowed to buy two tickets with a discount depending on the level of your Cinema Club membership and ten tickets for the regular price. 4. Choose the seating in the auditorium. You can pay for the tickets with the Forum Cinemas Gift Voucher or any other payment card issued by any Latvian, Lithuanian or Estonian bank. To make the payment with the Gift Voucher, please, enter the voucher number in the appropriate box above the list of products. To make the payment with the E-Voucher, click "Pay with E-Voucher" and choose the appropriate E-Voucher. To make the payment with a payment card, please, fill in all the requested boxes with correct information from your card. To continue, click "Send". Before confirming your payment, please, make sure that your purchase session has not timed out. If you make the payment after the session has timed out, the delivery of the tickets will not be authorised even though your account will be charged (in such cases, please, inform us by writing to: kino@forumcinemas.lv). Please, be careful and if you are not sure of being able to fit in the purchase session, restart the purchase. MasterCard and Visa Card holders have to fill in also CVV2/CVC2 (last 3 digits of the number on the back of the card). If you cannot print out the tickets you have purchased at once, you can do it also from an ATM in the cinema or at the box office. To print out the tickets from the ATM in the cinema or at the box office, you will need the purchase confirmation code. printing out the ticket, its text and bar code must be clear and readable. In case of an unintelligible printout the staff can ask you to print out the ticket once more at the cinema box office. Please, do not copy the tickets as only the first customer with the original bar code on the ticket will be admitted into the auditorium. Other customers that will show tickets with the same bar code will not be admitted into the auditorium. Welcome to our cinema and have fun at the movies! We thank you for buying your tickets online. See you soon again!